Apart from solar PV, wind mills and hydro-electric are the other two Renewable Energy sources that interest me. They offer different kind of challenges but could also be very rewarding. I mentioned in my previous article about Sabah's good potential in harnessing energy from wind by putting up wind turbines offshore on its northern tip. 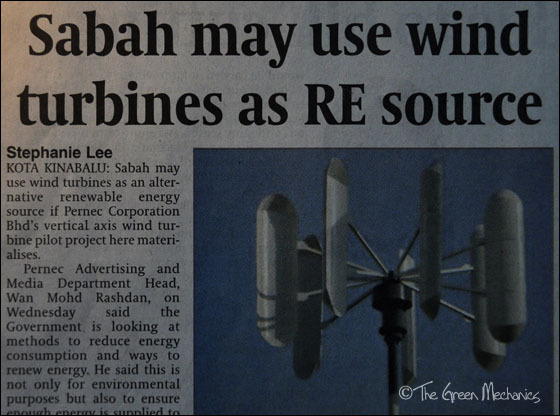 Recently, a local company thought that Sabah could be the beneficiary of its RE initiative in testing the viability of vertical wind turbine power generator. Apart from Pulau Perhentian in Terengganu, Sabah has the right geographic factors to generate enough wind for wind-turbine projects that can be worked out between corporate bodies or private investors and SESB. Pernec Corporation Berhad, one of the exhibitors at the popular MSAM 2012 currently on-going at Kota Kinabalu Sports Complex in Likas, told the media that it is planning a further discussion with SESB on a possibility of using vertical axis wind turbines as an alternative renewable energy source. One of the RE industry solutions offered by Pernec is wind turbine. Pernec claims that its wind turbine emits low noise and can generate between 300W and 25kW; most suited for windy and coastal areas or islands. The company also provides environment-friendly solutions for our everyday needs such as power (solar PV), lightings (LED), refrigeration & air-conditioning (green HC refrigerant), as well energy saving and conservation through efficient energy management system. Coming back to wind turbines, in Hawaii, there have been complaints from residents staying nearby wind farm. It was reported that the noise from the wind turbine blades is very loud and sometimes intolerable. Hawaii government is currently actively perusing RE initiatives, particularly wind farming, to reduce it dependence on fossil fuel. Pernec claims that the company's turbines emit low noise, so, it is very interesting to find out how they make this possible. But looking at the highest capacity of 25kW, noise level may not yet be an issue. Vertical construction may also play a part in keeping noise level in check. The company is believed to be planning a pilot project on vertical axis wind turbine in Sabah and if this materialises, SESB should take it seriously. Not just because it helps in preserving the nature but also the possible long term profitability of such venture. Let's harness energy from 'thin air'.